The celebration of major family events is a vitally important part of Uzbek culture, and perhaps no event is more important, or more lavishly celebrated, than a wedding. 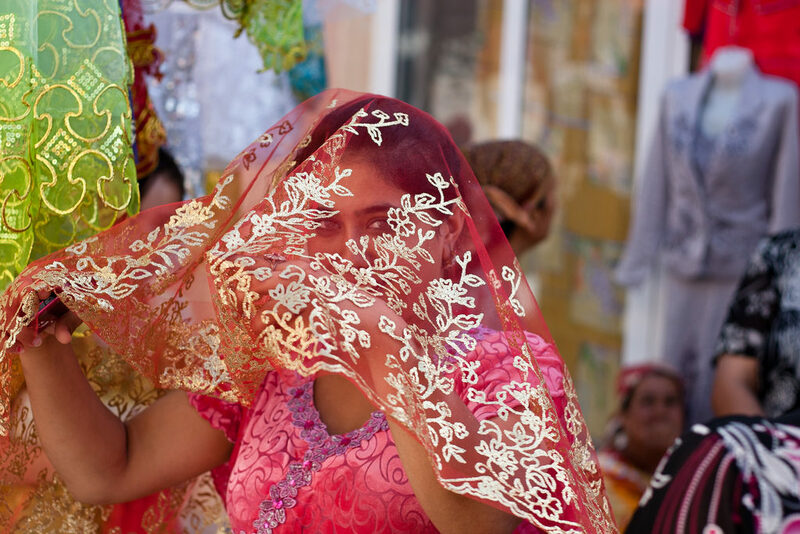 A social milestone that families begin planning for as soon as a child is born, a traditional Uzbek wedding is an impressive and elaborate affair that draws on rites and customs that have remained largely unchanged for hundreds of years. 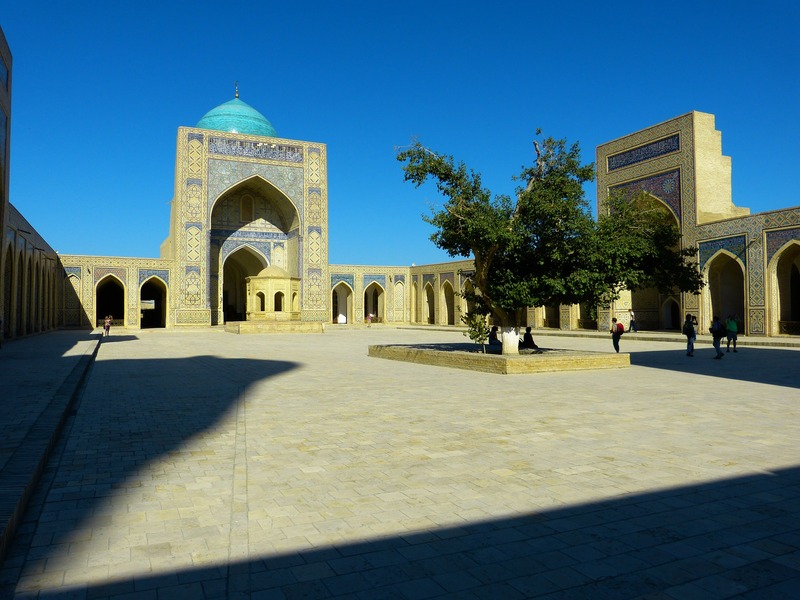 Read on for eight amazing facts about weddings in Uzbekistan. Because family is such an important aspect of Uzbek culture, everyone from the bride and groom’s families—even the most distant relatives—will be invited to an Uzbek wedding, along with friends, neighbors, and other close acquaintances. 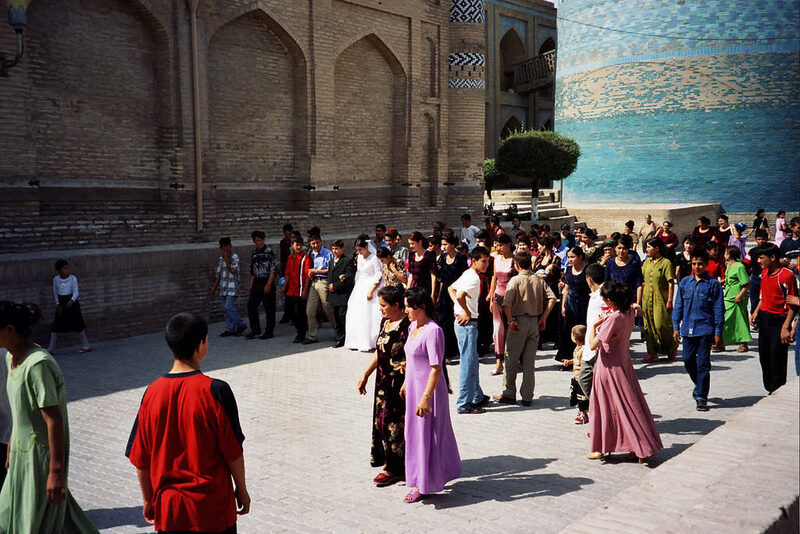 This can make for some pretty big parties: a typical wedding in Uzbekistan boasts between 200 and 300 guests, and even larger gatherings are not at all uncommon. They are preceded by an engagement ceremony. Uzbek weddings are about much more than the ceremony itself: equally important are a host of rituals that take place both before and after the wedding day. One of these is the engagement ceremony, or the Fatikha-Tui. Performed at the bride’s family’s house, this tradition involves representatives from the groom’s family—often known as “matchmakers”—asking the bride’s parents to approve the marriage. If the parents agree, the ritual of “Non sindirish,” or bread breaking, is performed. From this moment, the couple is considered engaged, and the wedding day is set. They last for four days. 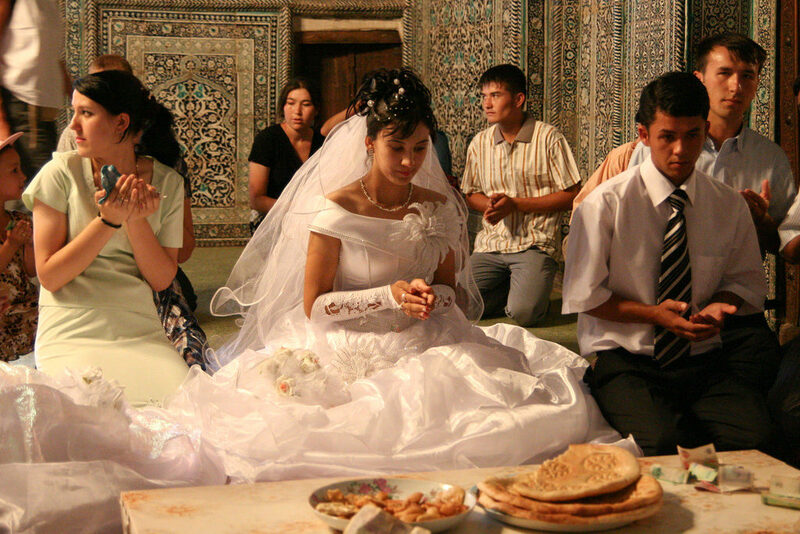 Because of the multiple rituals involved, an Uzbek wedding unfolds over four days rather than taking place during a single day, with different events happening on each day. The first day is the wedding ceremony itself, which traditionally happens at the bride’s family’s home. On the second day, the bride’s family sends a breakfast to the newlyweds called “Yisilike,” and a ceremony is performed to remove the bride’s veil. The third day is the “Kelin salom,” or the welcome of the bride: for this event, the bride’s parents host a feast of thanks, or a “Qialilake,” during which guests present the bride and groom with gifts. On the fourth day, it’s the groom’s family’s turn to host a Qialilake feast to show their appreciation to the bride’s family. The groom collects the bride with a musical entourage. On the morning of the day of the wedding ceremony, the groom, along with his best man and various male relatives and friends, goes to pick up the bride at her home. This ceremonial journey is traditionally accompanied by dancers and musicians who play celebratory songs on instruments including the karnay, a type of long trumpet, and the doira, a medium-sized drum that features metal rings, like a tambourine. An important moment of the wedding is the bride’s farewell to her family. One of the most important moments in an Uzbek wedding takes place in the evening on the day of the wedding ceremony. At this point, the bride says farewell to her parents, and leaves her family home to travel to the groom’s home, which will be her home from now on. This is a moment of symbolic mourning for both the bride and her parents: the bride is expected to embrace her mother while weeping, and when she leaves her parents’ home, her sisters or female friends accompany her while singing traditional farewell songs. Plov plays a big role. Plov, or pilaf, is the national dish of Uzbekistan, so it’s not surprising that it’s an important feature of Uzbek weddings. Traditionally, the morning of the day of the wedding ceremony begins with a meal of plov for all the relatives, friends, and neighbors participating in the wedding. Though it’s customary for the morning plov to be prepared by male relatives at the homes of the bride and groom, it’s becoming more common to have the plov prepared at cafes or tea houses for the sake of convenience. Traditional handicrafts are often given as gifts. While some of the gifts given to an Uzbek bride and groom are standard things that they will need as they start their new lives together, such as practical furnishings and supplies for the household, it’s also very common for guests to give the couple traditional handicrafts. For example, embroidered tapestry covers known as “suzanis” are a customary gift, and suzanis that are given as wedding gifts are usually decorated with very specific patterns. Newlyweds also commonly receive traditional Uzbek dresses: the practice is to hang them up on the walls of the bride’s house or that of her family so that guests can visit and admire them. There are lucky days to get married. The number 7 is an auspicious one in Uzbek culture. Not surprisingly, therefore, the 7th, 17th, and 27th days of a month are considered especially good days for a wedding.